Experience Sierra Bella, Spanish for beautiful sierra, in Carnelian Bay. 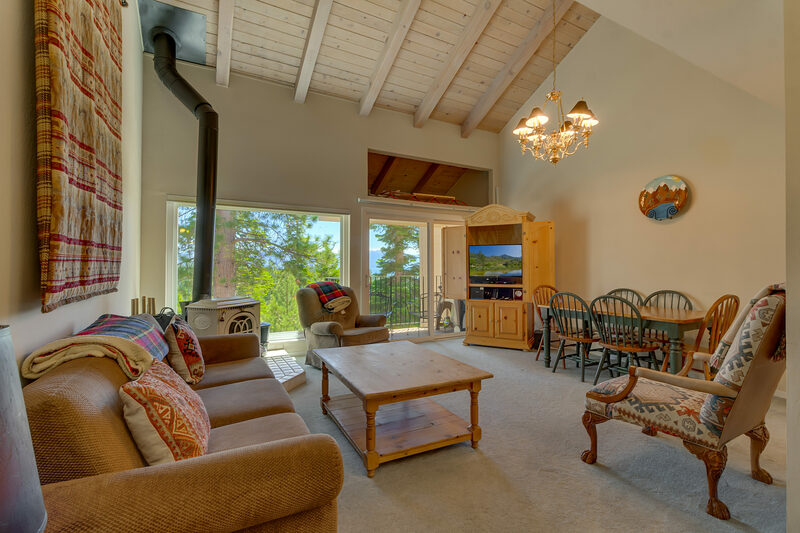 Admire breathtaking Lake Tahoe views from the living room and master bedroom of this charming townhome with room to sleep eight guests. 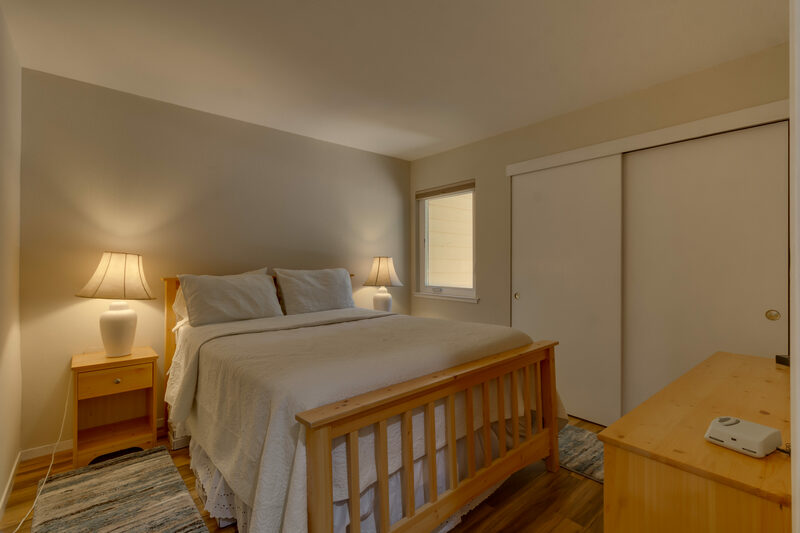 On the entry level, you’ll find the master bedroom with a queen bed, a TV, DVD player, and a glass sliding door to the covered deck with views of beautiful Lake Tahoe. The second bedroom features another queen bed. 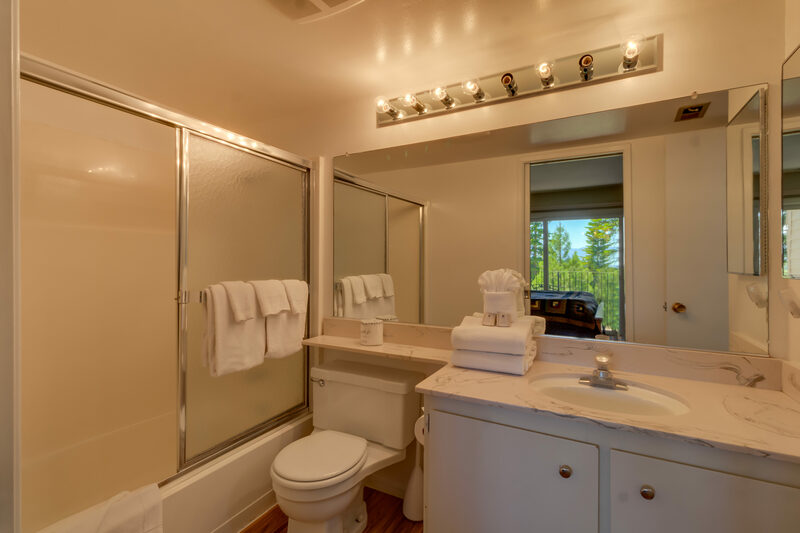 There is also a full bath with a tub/shower and a laundry closet across the hall. On the second level, a sofa sleeper and two comfortable chairs provide the perfect spot for putting your feet up and taking in the view through the huge picture window and glass sliding door. There's a wood-burning, free-standing fireplace for warmth and added ambiance. Keep everyone entertained with Wi-Fi, a flat screen TV with cable, and a DVD player. This level also includes the second full bath with tub/shower. Plenty of bath linens are provided. For home-cooked meals, barbeque on the gas grill, then finish meal prep in the kitchen—with all you’ll need to create meals and memories. A healthy breakfast or roast beef dinner are easy in this space where the dishwasher makes clean up a breeze. There are six chairs at the dining table plus three more chairs at the breakfast bar. 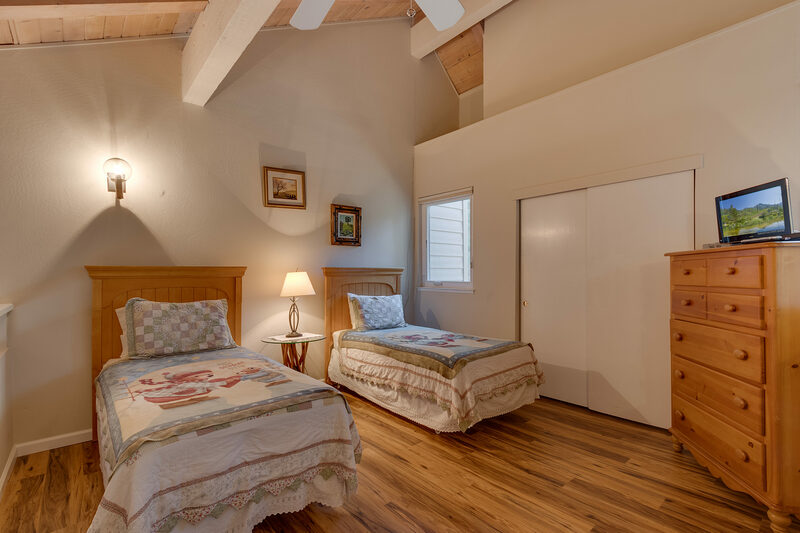 On the loft you will find two twin beds and a TV, the perfect space for kids of all ages. At Sierra Bella, take time to unplug from the daily grind. Listen to the wind whisper through the pines while you relax and sip your favorite beverage on one of the decks. 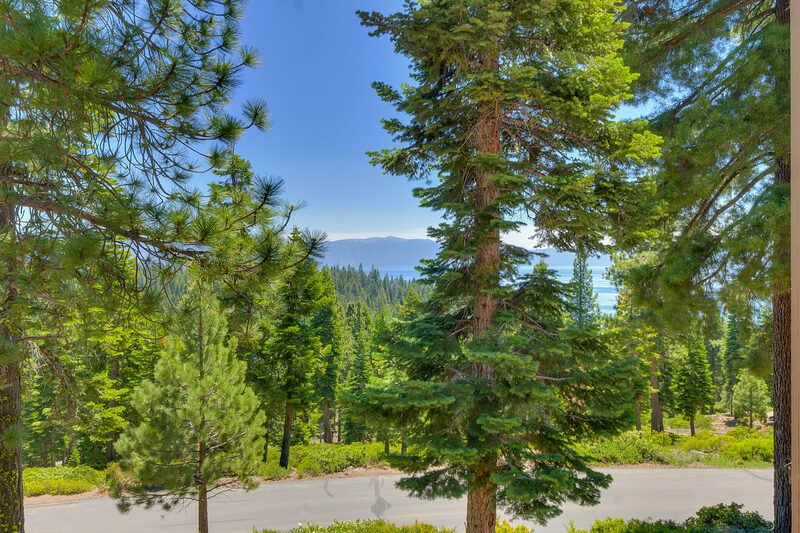 Unwind and reconnect with good conversations as you appreciate the sparkling lake and forest views and rest in Tahoe’s unhurried pace. When you’re ready to venture outside, keep everyone entertained in this perfect vacation setting. The Recreation Center / Lodge features a swimming pool, two outdoor hot tubs, locker room saunas, a game room with billiards, a video game arcade, tennis and bocce courts, and a fitness trail. The complex backs up to Tahoe National Forest, offering miles of hiking, biking, cross-country skiing, and other activities year-round. 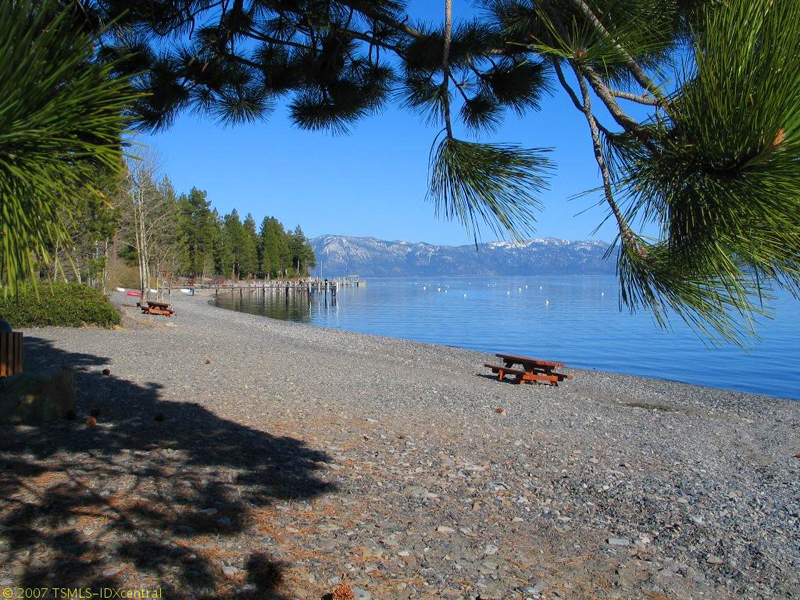 Your home away from home is in Carnelian Bay, where all North Lake Tahoe is right at your doorstep! Stroll down to Magic Carpet mini golf or check out Waterman’s Landing, located at Patton Landing Beach, a 3-acre, pebbly beach known for stand-up paddling. To experience Lake Tahoe gambling and nightlife, Incline Village and Nevada's historic casino Crystal Bay are a short drive away, just across the state line. Closer to home, you'll find superb dining options right in town like Gar Woods Grill and Pier for steaks and fish, the Old Post Office Coffee Shop for hearty breakfasts, and CB's Pizza for hand-tossed pies and beer. You're only 10-12 miles from three great ski resorts—Northstar, Alpine Meadows, and Squaw Valley. Whether you prefer to downhill or cross-country ski, snowboard, snowshoe, or go sledding or ice skating, North Tahoe is the place for winter fun. At Squaw Valley, after conquering the slopes, go tubing with the kids or try out the mini snowmobiles at SnoVentures Activity Zone. There are dogsledding tours too! In every season, the Village at Squaw Valley offers dining, shopping, the Squaw Valley Aerial Tram, and a variety of activities. In the summer, ride the Aerial Tram to High Camp then choose a scenic trail and walk or hike in one of the most breathtaking places in the world! At 8,200 feet elevation, admire the beauty of the Sierra Nevada Mountains with views of Lake Tahoe and Squaw Valley's legendary granite peaks. In the Aerial Tram building lobby, kids and grownups can have a blast climbing the variety of routes on the 30’ simulated Headwall Climbing Wall. If you dare, learn how to do a front or back somersault at Skyjump; all ages are welcome. Our group of friends headed to Tahoe for a relaxing weekend away. The place was clean and comfortable to stay in, with more than enough kitchen items to cook and eat with should you decide to cook meals at home. Management was prompt responding to any questions we had, all times answering our questions within hours. Great customer service! We didn't have time to explore many of the other amenities, however it is conveniently located between North Star and Squaw, should you choose to head to either resort for snow activities. Sierra Bella was a wonderful cabin for a Tahoe weekend getaway. The house was very cozy, with a great layout. We ended up snowed in for an extra day and we couldn't have been happier to spend it here. ignoring in the process the woman who paid for the stay "Christine Robinson " I don't know why you continue to do that. Please update your records and send this survey to her. Thanks. The vacation home was great. Things were overall clean and in good shape. The kitchen had all the dishes needed for cooking. There were enough linens for us to be comfortable. Internet accessible TV. There is a partial lake view from the balcony, which was unexpected and lovely. Downside: The master bedroom had animal hair all over the hardwood floor & rugs, which is the only area that did not feel clean. A little touch up paint (furniture marked the walls in the living room) could help spruce the presentation up. Sierra Bella - Great lake view! Great value. Management was very responsive to all of our questions. This wasn't the property we had reserved but because the property that we were planning to stay in had an issue the day we were going to checkin, we were given this property which was comparable. Overall it worked for the 5 adults we had in our group. The beds were comfortable and we had plenty of sleeping areas. Lake tahoe in the summer gets warm in the days and cools off dramatically at night which did help the 3rd floor loft sleeping area since it didn't not have a working ceiling fan since these units do not have air conditioning. The kitchen cabinets and drawers are in need of an update. All the appliances worked well though. And like others have commented both bathrooms have tub showers and for some reason the shower heads are located low. Neither bathroom have been updated either but everything was in working order. Enjoyed the views from the balconies towards the lake. We loved this location - perfect distance to both Northstar and Squaw/Alpine. Nearby to local eateries and a grocery store. Quiet and plenty of room for everyone. Super clean and warm! We didn't want to leave. very clean. easy process. highly recommend. Quiet, great views. We really enjoyed the pool. Materials available for cooking were scarce. Plumbing fixtures in main bathroom in tub were loose and in need of minor attention. TV / Entertainment console was quite large, limiting where it could be put, thus it commanded the living room, this was unfortunate -that is if you do not watch TV which we do not. Otherwise facility was lovely as was the stay and location. We enjoyed our stay. Snow clearance was excellenctboth on the road and the pathway. Property was as the pictures showed with a nice view and reasonable furnishings. The kitchen is compact and there were not enough chairs for 7 in dining area but we used outside chairs instead. A couple of things did not work but the property manager had these fixed straight away. The kids loved the loft area. We enjoyed our stay at Tahoe! Everything was good except the management . Left several message and never heard back. I was concerned what if it was an emergency? There was no one to be found. After hours emergencies are responded to immediately. After hours non-emergency calls are returned the following business day. Great stay, good value & actual lake views! Place was clean and location was great, nice view of the lake from the balcony. Dealing with Property Management was easy and they were very professional. Had an issue with dishwasher and could not use but wasn't a real big deal. Would definitely recommend and will most likely stay there again if available on my next visit. Our 3-generation-family has comfortably stayed in this condo for the past three years. We were pleasantly surprised to recently find a new pull-out couch in the living room and a new TV in the loft. The kitchen continues to be well-equipped; the propane BBQ worked well and we all enjoyed the many amenities of a great pool, tennis courts, sand volleyball court & woods. The downsides included a very uncomfortable mattress in the first bedroom and a slow & unreliable internet system. The reservation process went well. Check-in went well; however, it would have been helpful to have been given the tennis court entry code at check-in. We had a great vacation! Place is great with family with kids. Nice location and closed to everything including beach and hikes. Lots of things to do around Tahoe. The place could use an upgrade in furnitures like the dishwasher is old and it doesnt clean the dishes and big plates dont fit. The shower stall r too short and its hard to get in if u are tall. The bed in the 2nd bedroom is very uncomfortable, my back hurt. I felt the spring of the mattress. The cleaning people didnt arriveed to clean until 4:00 pm which is when we checked in. They had to rush cleaning the place and left the laundry in washing machine for the bed sheets. But over all the place is great for family vacation. Nice club house - has pool, hot tub, video game room and pool table for kids. We got the view on our deck too. The town house needs a new can opener! I almost sliced my finger open using the vintage one there. Was even considering going to buy one for the place it was so bad. Also, the video games in the game room could be a little updated. Not too fun so the kids were disappointed with that. All in all, great place. Would definitely stay here again. 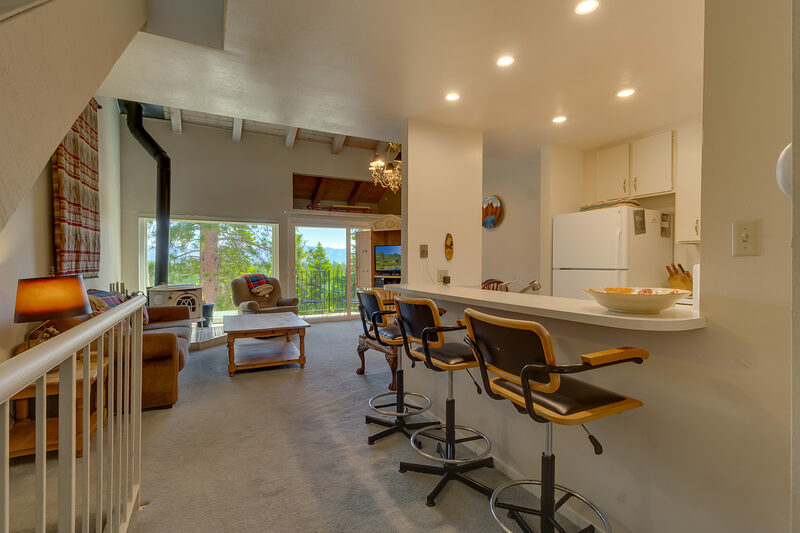 This is our 4th family vacation at this wonderful Carnelian Bay condo called Sierra Bella. 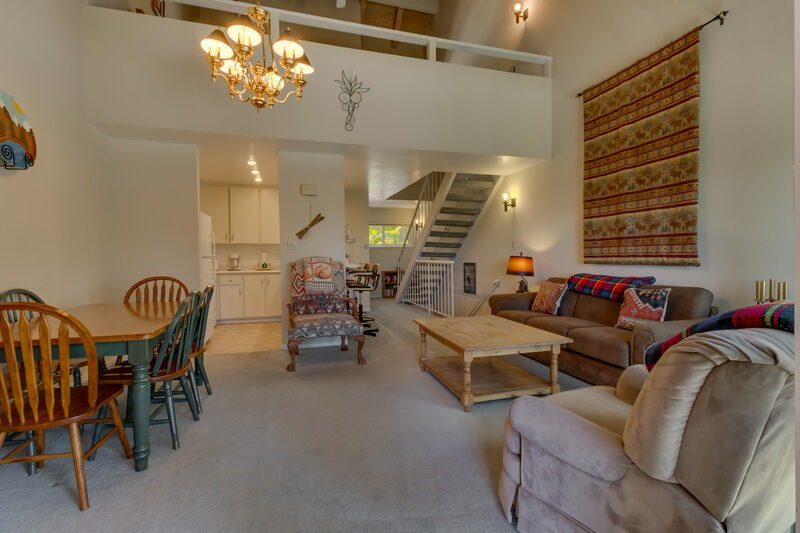 Three generations of our family again enjoyed the comfortable, spacious condo that sleeps 8. We rested well on the new bed mattresses and other upgraded amenities. 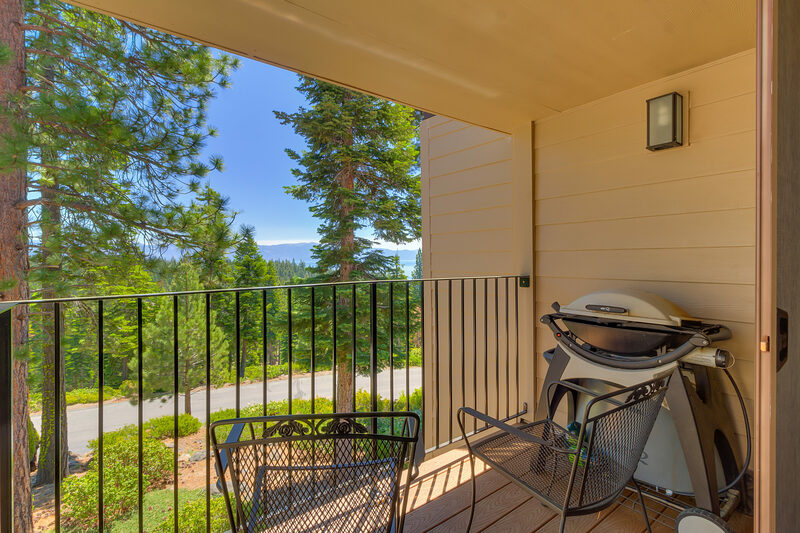 The barbecue worked well on the deck overlooking Lake Tahoe and the kitchen was well-stocked with cooking pans, cooking utensils, and dishes. The office staff at Carnelian Bay were very friendly and we enjoyed the beautiful pool, bocce ball course, basketball, ping-pong and tennis courts. Walks in the woods were breathtaking and refreshing. Our family also enjoyed picnicking at King’s Beach, kayaking in the early morning hours on the lake and walking the Nature Trails along the Truckee River. We are already talking about next year! I highly recommend this wonderful condo for your next family vacation. The whole family enjoyed staying here. It was so quiet and the view from the upstairs living room was gorgeous. Everything was lovely and clean. Would come back and stay again. This is our 5th year in a row at Sierra Bella. We had 4 generations enjoy the condo this year. 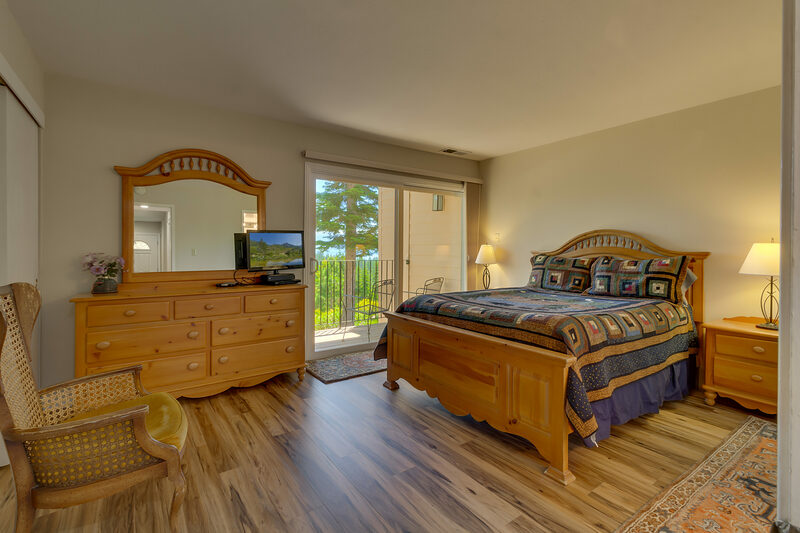 The lake view from the balcony and master bedroom is beautiful, the crisp mountain air is refreshing and the pine trees are beautiful. The condo was again very clean and maintained, the new bedroom mattresses are very comfortable, the kitchen is well-equipped with pots/pans/dishes etc. and with a large family, the two bathrooms, dishwasher, BBQ, washer and dryer and WiFi are all appreciated. The staff at the lodge are very helpful and the amenities of the beautiful pool area, spa, ping pong, basketball, tennis, sand volleyball, pool table and hiking areas were enjoyed by all. We returned home refreshed already planning for our next visit to North Lake Tahoe and this lovely condo. This condo was perfect for the amount of time we were there. Everything was clean and the view spectacular. 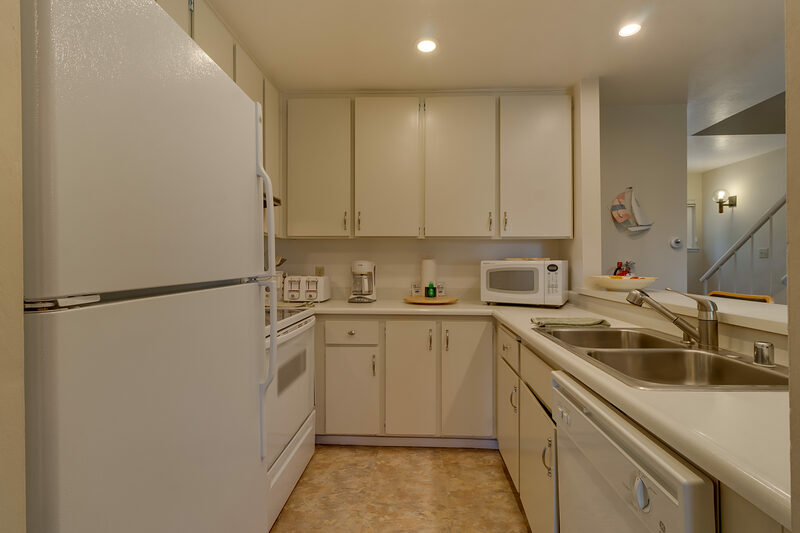 However, the kitchen could use a makeover- very outdated - hated the dishwasher - so 1970s. The showerheads in the bathrooms were too low - I'm 5'4 and had to duck to wash my hair. Maybe put the showerhead on the drywall and not in the shower fiberglass unit. Can't remember if the tub had a stopper in case you have young children who want a bath. We ate at GarWoods Restaurant just down the hill from the condo. Pricey but great food. We also ate Zia Lina Ristorante (Tahoe City) - best Italian food in Tahoe; tacos at Taco's Jalisco, Truckee; Bocce ball and wine at Truckee River Winery (great wine there). I recommend this condo for large families as well. Kid décor in loft area. We stayed with our family of seven, including a teenager and four young boys. The space was roomy enough for us. The upstairs "bedroom" is an open loft which made it hard for the little ones to fall asleep while we were still up but when they were tuckered out from sledding all afternoon, it was a little easier for them. We didn't find the recliner or the bed in the master bedroom incredibly comfortable but they were sufficient. It's not new or luxurious but it is very clean and the views are amazing. We had everything we needed for our week's stay. We loved the location too which is quiet and off the road a bit. There is a small free sledding hill at the golf course in Incline Village and another free public sledding hill around the lake at the 28/50 split in Nevada (30 minute drive). We didn't go there this time, but we enjoyed Gar Woods Restaurant, just be prepared to pay $$$. The rec room was fun but we were sad that even the pool table required money and the Air Hockey game was out of order. Check-in and check-out were easy and we would probably stay again. For the price we paid, we were very happy! The ceiling fan has been replaced. The TV in the loft is for movies only not cable TV. Great wooded area, fun for the family. Would love to come back. A great place for the holidays! The condo was fantastic. Spacious, well apportioned, very clean, with plenty of warm blankets and kitchen supplies. The only downside was that the heater wasn't working properly when we arrived, but after a quick call to the property manager, someone came out immediately and repaired! Property is gorgeous, with lots of beautiful places to explore and a fantastic view of the lake. Would definitely recommend to a friend, and stay in the future if we ever travel to Tahoe again! The property is very nice and well maintained. The one immediate issue (broken DVD player) was remedied in 1 day. Would like to report that the exhaust fans are loose and noisy, especially downstairs is enough to wake people up. although the unit is clean, it is showing some wear and tear and should probably be updated, cabinet door knobs stripped. Will definitely try to come back, we loved our time there !! This is a nice place nested in the woods. 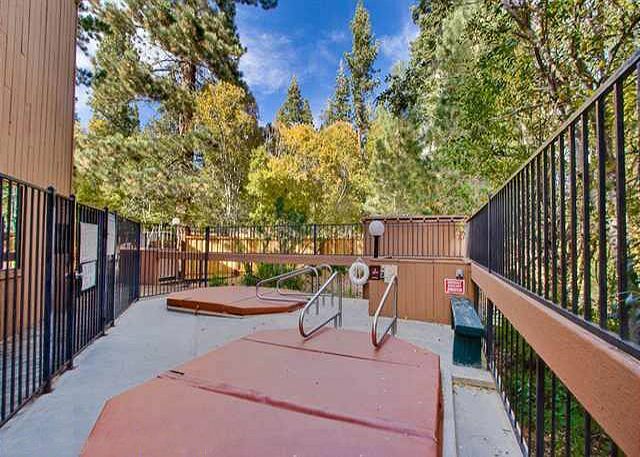 The complex is well maintained and a short drive to Kings beach and Tahoe city. The unit is in good shape and very clean, and has a nice lake view. The kitchen is well equipped. It could use a bigger heater as the hot water runs out after a couple of showers. The local beach is more of a river rock beach than a sandy one. The complex pool is heated to a comfortable temperature, though sun is blocked by the surrounding trees most of the afternoon. Overall, I think this condo is a great place for one or two families to have a relaxing vacation. The view from the property was very nice. The location also was good. I would recommend to replace the bbq grill, as it lived it’s days.